Stuck in a workout rut? Making even small changes to your workout routine can result in major changes to your body. The trick is to keep your body guessing during your workouts. If you never vary your activity, eventually your body will become accustomed to it and stop adapting. 1. Change Speed/Intensity – Simply running faster for a minute, then going a little slower for a minute, can help you lose weight faster than moving at a steady pace your entire workout. Working out just a little harder will not only burn more calories during your workout, but during your recovery as well. 2. Switch from Machines to Free Weights - Machines are great for teaching you the correct movement patterns, but if you really want to engage more muscles, use free weights. Free weights will pull in the same muscles as the machines, as well as stabilizer muscles around the joint. 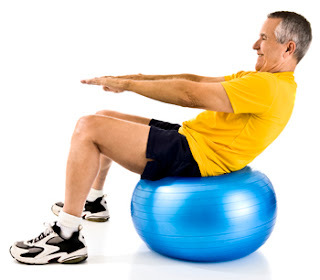 Perform exercises on a stability ball or BOSU ball to add in your core muscles, too! 3. Try Something New – Hop on that elliptical that you walk past every day as you head towards your favorite treadmill, join in on a game of pick-up basketball or volleyball or even try out that new fitness class that you heard about. You will be surprised how much of a workout you can get when you are doing a new activity. Share your favorite workout modifications in the comment section!